Discussion in 'Members' Club Room' started by bd popeye, Jul 2, 2012. If it seems like the plans for the Falcon Heavy fall short of Musk’s Mars ambitions, that’s because the rocket has been superseded. Last fall, Musk announced updated plans for the Big Falcon Rocket, a giant booster rocket with a large spaceship that sits on top. It’s meant to shuttle hundreds of humans to the Moon or Mars, but was also suggested by Musk as a way to pull off quick flights around our own planet. Musk said that all of SpaceX’s resources would be poured into developing the BFR when he announced the new rocket architecture, and that it would eventually obsolesce both the Falcon Heavy and the Falcon 9. This week in Florida, he reinforced that commitment. He said the company may even be abandoning plans to fly humans on the Falcon Heavy, moving those missions to the BFR. SpaceX plans to fly humans in the Dragon spacecraft on top of Falcon 9, and the company had initially planned to do the same with the Falcon Heavy. One of the missions SpaceX is planning would use the Falcon Heavy to send two paying tourists around the Moon later this year. And the company obviously had its sights set on using the Falcon Heavy to take astronauts on similar journeys. But development of the BFR is coming along at such a clip that Musk believes the company will move these potential missions to the larger rocket, he said earlier this week. That means the Falcon Heavy wouldn’t have to go through the time-consuming process of getting approved for human spaceflight. As it stands, Musk said he believes SpaceX will be ready to perform “short hop” tests of the BFR spaceship sometime in 2019 at the company’s new (and unfinished) facility in Brownsville, Texas. These would likely resemble the earliest tests of the Falcon 9 rocket, which were simple flights of a few hundred meters or so. Musk believes it’s “conceivable” that SpaceX could perform an orbital test flight of the BFR in three to four years, the CEO said in a press conference after the Falcon Heavy launch. That’s close to the timeline he first laid out last fall when he announced the BFR’s existence. But Musk, who is notorious for missing his own deadlines, admitted that some of these goals were “aspirational.” And even if the tests are a success, it would still mean a delay in the company’s goal of flying tourists this year. SpaceX is a business, and it needs to make money. It does that with its workhorse rocket, the Falcon 9, which launched 18 successful missions in 2017 — the most ever for the spaceflight company. SpaceX’s 2018 launch calendar is even more ambitious. Many of those launches will send satellites or ISS cargo to space. The ones most closely watched, though, will be those that relate to shuttling NASA astronauts to the ISS. First, the company will fly a demonstration mission using the Falcon 9 and an empty version of its human-carrying Dragon spacecraft. That’s slated to happen sometime midyear. If that test goes well, NASA astronauts could fly into space in a Dragon spacecraft aboard a Falcon 9 by the end of the year. But it’s also likely that the crewed mission will be delayed. A recent report from the Government Accountability Office claimed SpaceX won’t be certified to fly NASA astronauts until late 2019 at the earliest due to safety concerns. We’ll also see the company continue to attempt to catch the two halves of the nose cone that covers up each rocket’s payload, known as the fairing, in 2018. 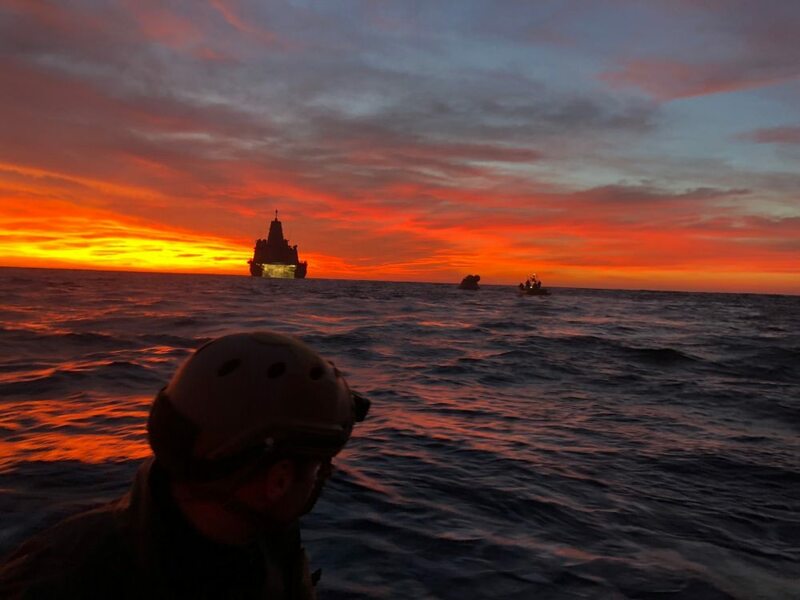 SpaceX recently retrofitted a boat with massive metal arms with the intent of catching the fairings before they splash down in the ocean — “like a catcher’s mitt,” Musk said this week. Musk also mused that SpaceX could use this boat to catch a falling Dragon spacecraft. SpaceX has a number of ambitious goals for the next few years. The company plans to increase the pace of its rocket launches, which is already at more than one per month; start flying humans to the ISS and around the Moon; and finish developing and testing the BFR, which would pave the way for the company to achieve Elon Musk’s goal of colonizing Mars. It’s a pretty full slate, but it’s still not the whole picture. For one thing, SpaceX still has to show a lot more of its own work when it comes to the company’s plans for the Moon and Mars. Beyond a few pretty renderings of lunar and Martian bases, we still have no concrete details on how Musk believes he can (let alone will) build these human habitats. He has also often dodged one of the most important questions: how he plans to keep humans alive during extended spaceflight, where radiation is a problem. Large questions remain about how it would even be possible to live on Mars for any extended period of time. And, most importantly, it’s still not totally clear how he would fund the whole effort. It’s also unclear how the recent political shift in America might alter any of these plans. Musk still says his ultimate goal is to make humans an interplanetary species. But Donald Trump recently signed a (vague) policy directive with a renewed focus on the Moon. Both Trump and his vice president Mike Pence offered congratulations to Musk on Twitter after the Falcon Heavy’s success, and Musk was quick to thank each of them. SpaceX owes its success to NASA, which has been a customer since the very beginning. The company obviously hopes that doesn’t change anytime soon. If one thing is certain about where SpaceX goes next, it’s that some (or maybe all) of these plans will change — at least a little. Not only is Elon Musk known for stretching and missing deadlines, but he often tears the plans to shreds. What results from that process, however, can often be something spectacular. Incidentally the Tesla missed a Mars capture orbit. It's in a Orbital loop where the parapsis is around the earth the Apoapsis is in the Asteroid belt between Mars and Jupiter. Man What a Trip! COLORADO SPRINGS—Sierra Nevada expects to receive aeroshell panels next month for the first orbital Dream Chaser, marking a key milestone in the run-up to the start of spaceplane assembly at the company’s Louisville, Colorado, facility. The panels, along with the vehicle’s composite primary structure, are produced by Lockheed Martin, and form the bulk of the vehicle’s aerodynamic surfaces. The structural elements are coming together as Sierra Nevada continues through critical design review (CDR), the final phases of which are expected to be completed in July. The Dream Chaser is under development to deliver cargo to the International Space Station (ISS) under NASA’s 2016 Commercial Resupply Services 2 (CRS2) contract. It is on schedule for first launch in the fourth quarter of 2020 on a United Launch Alliance Atlas 5. NASA formally approved the go-ahead for the start of the winged vehicle’s cargo missions to the space station in early February. The flight will be the first of six under the CRS 2 contract. Sierra Nevada received the go-ahead after successfully completing a key autonomous glide approach and landing test last November at Edwards AFB, California. The test was performed using the engineering test vehicle, which was displayed here at the 34th Space Symposium. The vehicle will now be placed in “flyable storage” at the company’s Colorado facilities, says Steve Lindsey, vice president at SNC Space Exploration Systems. Unlike other commercial cargo providers SpaceX and Orbital ATK, which flew test missions to the ISS before operational launches began, the initial Dream Chaser spaceflight to the space station will also be the first time the vehicle will have flown outside of the atmosphere. “The first spaceflight will be the first flight to ISS, but it will carry extra propellant to undertake additional testing before we get there,” Lindsey says. The reusability design target for Dream Chaser is up to 15 flights. “However, how many we will actually do depends on the flight test data, so that airframe will be heavily instrumented,” he adds. 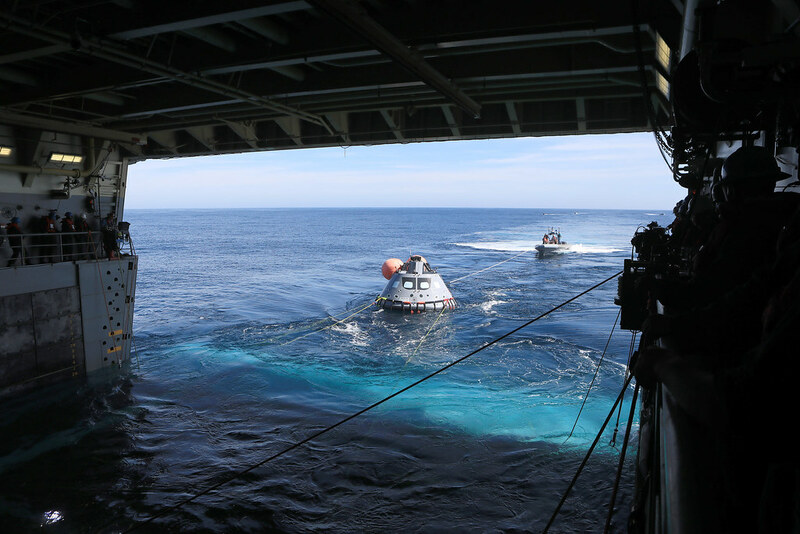 While the company’s focus is for now firmly on developing the cargo version, which will not have the flight deck windows of the crewed version but retains the same outer mold line, Lindsey says the engineering test vehicle will remain in mothballs for an unspecified period. “We’ll modify it for flying crew, put a pilot in there and do some testing in the future. If we fly crew it may not be with NASA. There’s a lot of international interest in the Dream Chaser and we don’t know what path that might take yet,” Lindsey says. The space company says it has received a strong response from launch providers to a request for proposals it issued covering multiple launches beyond the second mission in 2021. Sirangelo adds that a decision on the future launch choice is expected by year’s end. B.I.B. and Equation like this. PanAsian, Equation and Air Force Brat like this. Very neat, and no doubt we need to return to our leadership in space exploration! 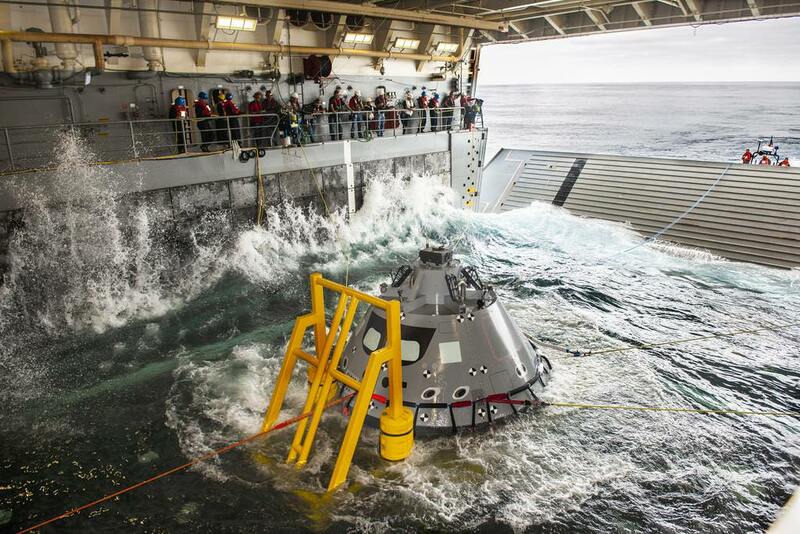 In case anyone did not know that Orion capsule is called a "Boiler Plate test article". 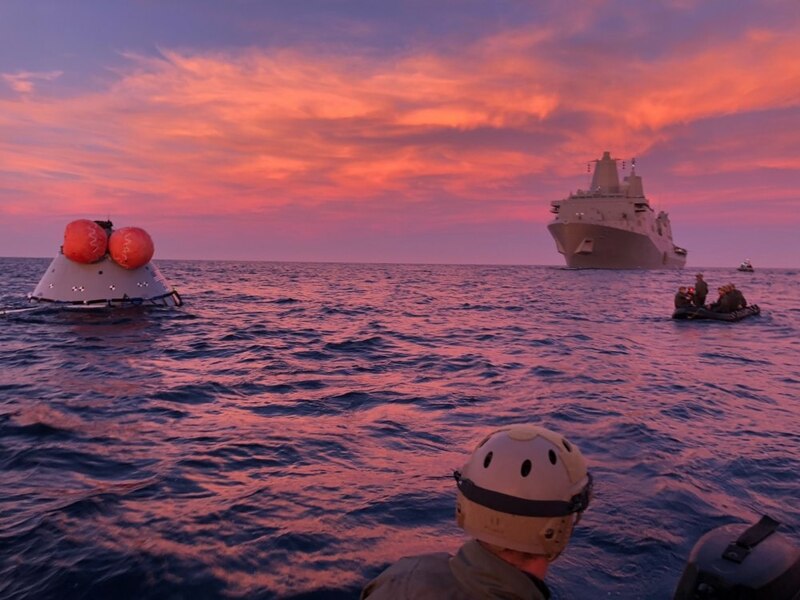 This looks like a US Navy MK20 liferaft to me. Quite sure we are already leading and will continue to. The radiation effects of "Deep space travel" will be a big issue for Orion missions. Hopefully the effects of radiation will be slight. 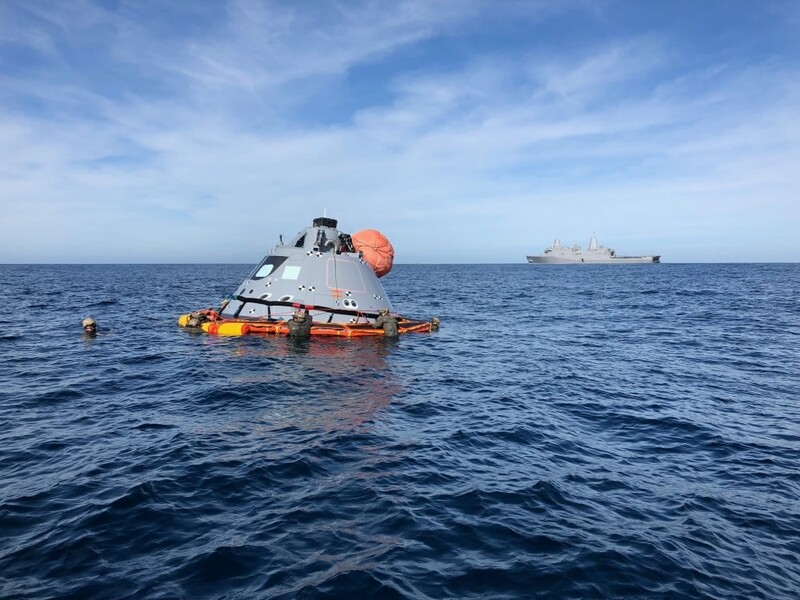 After splashdown the prime recovery ship will be an amphibous ship..not an aircraft carrier as with previous Mercury, Gemini and Apollo missions.. 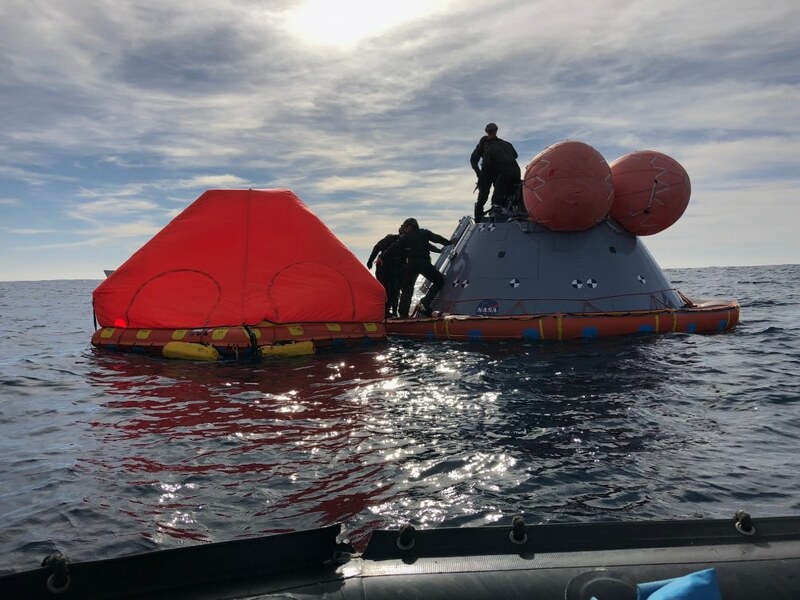 The capsule will be floated into the well deck and secured there...and the astronauts unless injured or ill will remain in the capsule until it is secured. Notice what the liferaft is carrying? Is it some kind of joke? Not quite. Orion is to small for true long range flights. On its own it might make the moon. That's assuming SLS actually becomes reality. 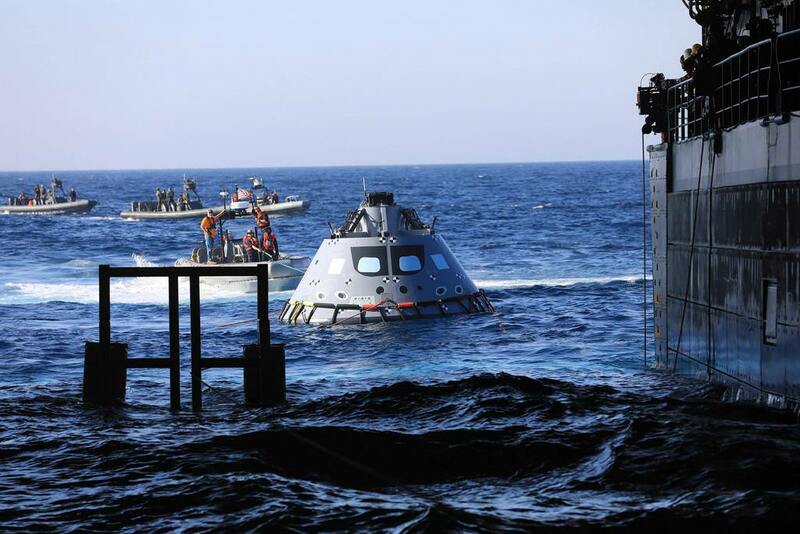 Orion just doesn't have the capacity to carry humans for months at a time. Breaking & World News! III NO DISCUSSION! !